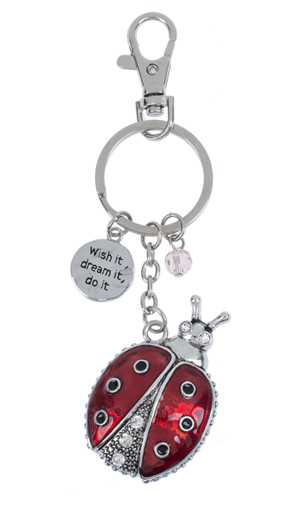 Home > Ganz Key Rings, Keychains, Luggage Tags > Ganz Key Rings, Keychains - Ladybug "Wish It, Dream It, Do It"
This Ganz Ladybug key ring is made of sturdy zinc embellished with colored enamel and rhinestones. It has a glass bead dangling mini charm, and a message charm that says "Wish it, dream it, do it". These keychains make wonderful graduation and hostess gifts. They can also be used on back packs, diaper bags, purses and more. ♥ Has 1 glass bead dangling mini charm, and a message charm that says "Wish it, dream it, do it"